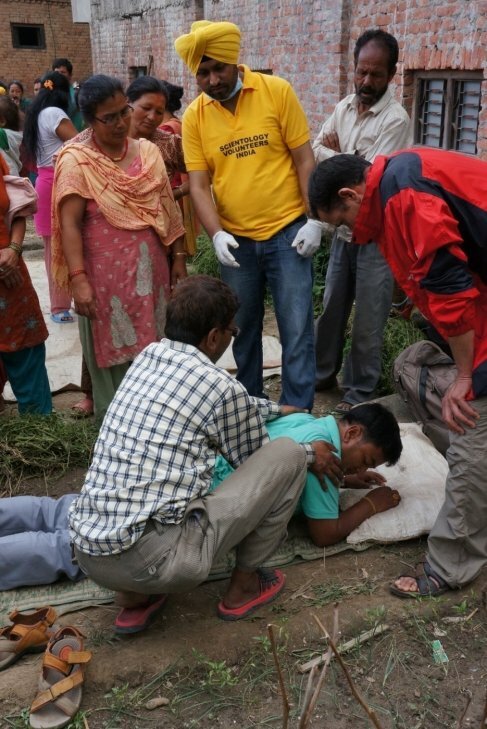 Scientology Volunteer Ministers sprang into action when the second major earthquake in 17 days hit Nepal 12 May. In the pandemonium that erupted when a 7.3 earthquake struck Nepal Tuesday on the heels of the massive 7.8 temblor just 17 days before – and resulting in dozens of additional deaths and several thousand new injuries – the seasoned first responders on the Scientology Nepal Disaster Response Team sprung into action to help with a fresh rescue effort to support those at risk, and to work to restore calm. The quake’s epicenter was 65 km from Kathmandu, near the Tibetan border and halfway between Mount Everest and the nation’s capital. On Tuesday at 12:35 p.m. local time when the temblor struck, the Mexican search-and-rescue group Los Topos was at the Volunteer Ministers headquarters in Kathmandu and began canvassing the area for those in immediate danger and moving them to safety. 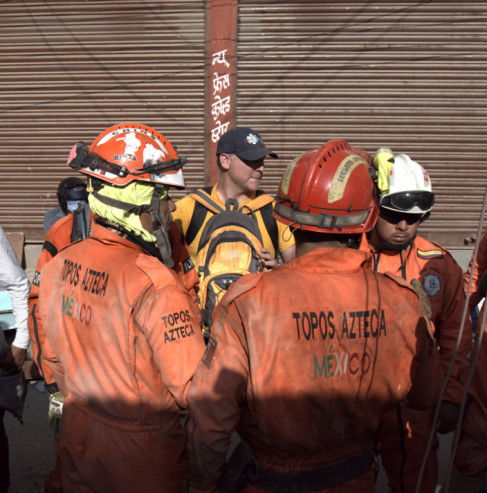 Then, at a hospital five minutes away, that was now too hazardous to be occupied, the Topos worked with facility staff and police to evacuate patients, including those in intensive care. Los Topos subsequently worked with Nepali police and Army to search for additional victims in the rubble of a collapsed building. They were able to verify that no one was trapped inside. At the same time, in Kirtipur, some five kilometers southwest of Kathmandu, a team of 20 Scientology Volunteer Ministers, including four medical doctors from India and the five-man team of Colombian first responders from CINAT (El Circulo Nacianal de Auxiliadores Tecnicos—National Circle of Technical Helpers), provided medical care, first aid and comfort at a high school that had been converted to a temporary shelter after the 25 April quake. The school was housing more than 100 people who had lost their homes. 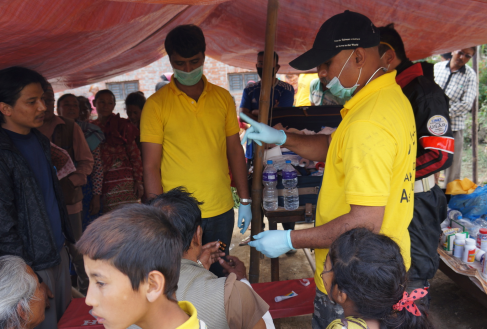 Many of those in the shelter at the time suffered new injuries and the Volunteer Ministers also scoured the neighborhood for any casualties and brought them to the shelter for first aid and medical care. It was while the volunteers were removing that school’s already unstable metal roof that the quake struck. “We were halfway through the removal when we got hit,” said one of the volunteers. The volunteers further performed many Scientology assists, techniques developed by Scientology Founder L. Ron Hubbard that are designed to help speed recovery for those suffering physical and emotional trauma. A second massive earthquake struck Nepal May 12, 2015. 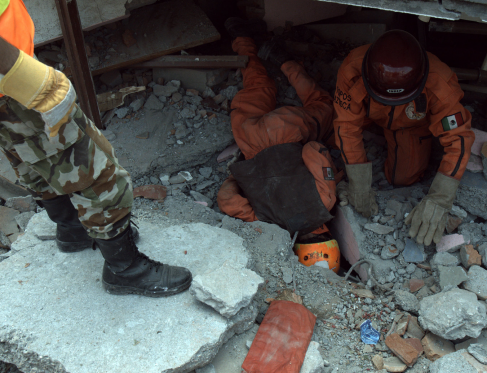 Los Topos, part of the Scientology Nepal Disaster Response Team, worked with Nepali police and army to help evacuate a hospital and search a collapsed building for any sign of victims trapped inside. Scientology Volunteer Ministers sprung into action to help May 12, 2015, when the 7.3 earthquake hit Nepal. 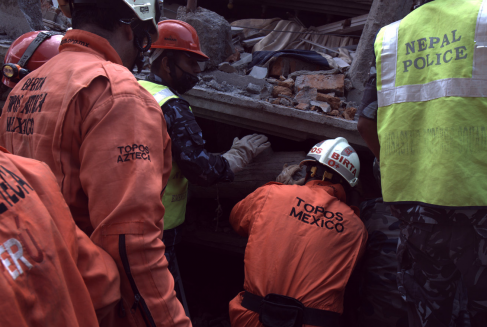 Los Topos at work, searching in the rubble of a collapsed building May 12, 2015, to ensure no one was trapped inside. Fortunately, they were able to confirm the building was empty when it collapsed. 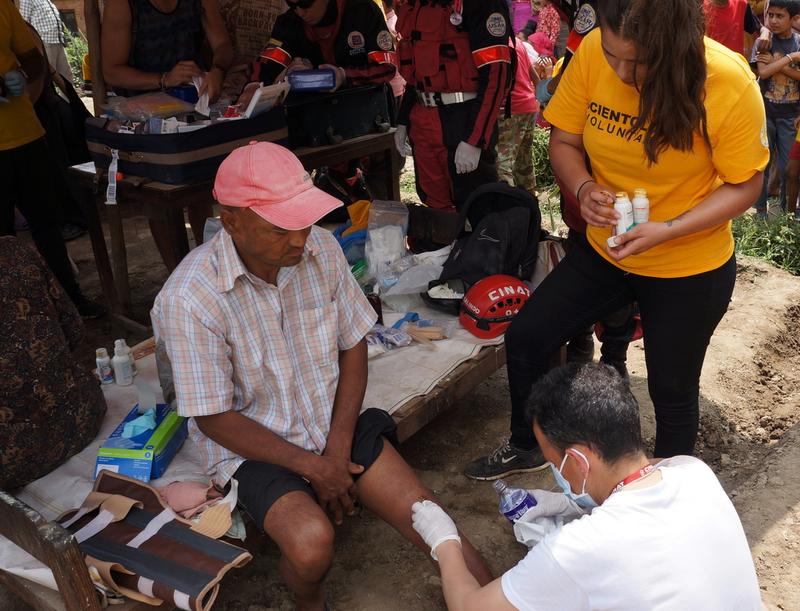 Los Topos, in Nepal as part of the Scientology Disaster Response, working with Nepal police May 12, 2015, in the aftermath of the 7.3 magnitude earthquake. A Colombian paramedic from the CINAT organization is assisted by a Scientology Volunteer Minister in the outskirts of Kathmandu, providing medical care May 12, 2015, for those injured by the 7.3 magnitude earthquake that struck at 12:35 p.m. local time. An Indian medical doctor who is also a Scientology Volunteer Minister showed people how to perform a simple Scientology assist, to help speed healing of physical and emotional trauma.